Bedrock Games is currently working on support material for Servants of Gaius. 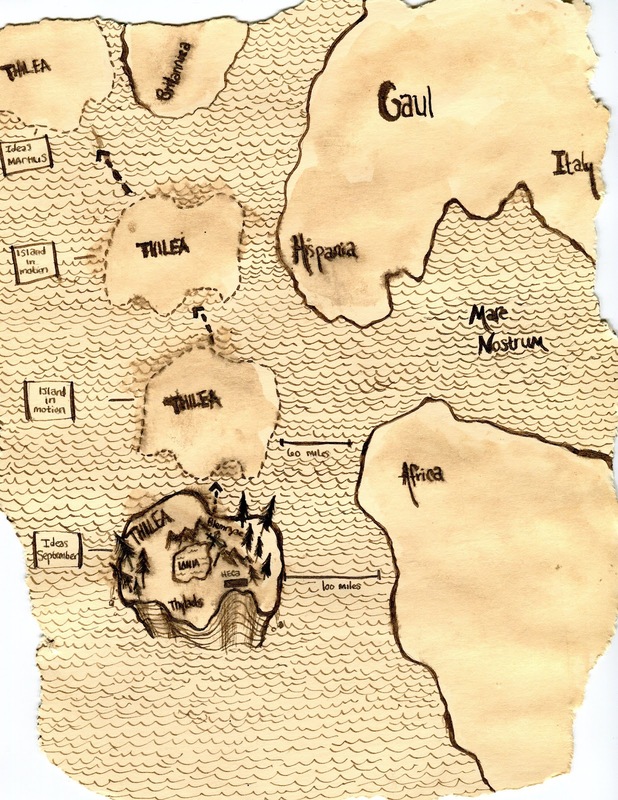 We believe strongly in adventure modules and setting books, so our first projects are Pomponius Mela's Guide to Aegyptus and The Secret of Actium. We will hopefully have both released by the end of the year. Pomponius Mela's Guide to Aegyptus provides gamemasters and players with a rich first hand account of the province of Aegyptus as well as several GM chapters on gods, monsters, equipment and non-player characters. It is in the final stages of development and should go into layout by mid-July. The Secret of Actium is a robust investigative module that brings our award-winning approach to adventure design to Caligula's Rome. It will be larger than most of our other modules in the past (both the page size and the page count) so it is quite the project. 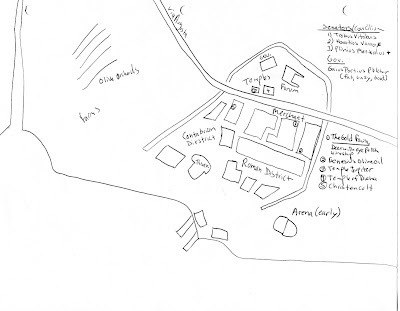 Anyone interested in playtesting The Secret of Actium can contact me at BedrockBrendan@gmail.com for a copy of the manuscript and regional maps. Down the road we will also release more setting books and adventures for Servants of Gaius. Starting next month, we will begin posting campaign material for Servants of Gaius. 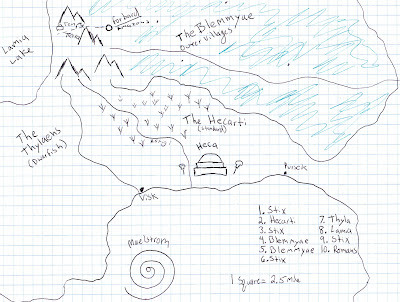 We plan to provide characters, locations (cities, shops, etc), adventure ideas or scenarios and much more. I will also hopefully be furnishing Avalong Games with content (seperate from that appearing on the Bedrock Blog) for their monthly magazine: Game Geek. For our blog content, I am encouraging fans to submit contributions. People have sent me some great ideas from their own campaigns and I would like to give fans of Servants of Gaius a platform to share their homebrew stuff. If we receive enough submissions then fan creations will be posted once a month. Anyone whose submission is selected will also receive a free Bedrock Games PDF of their choice. Down the road these may be bound into a free-pdf made available through places like RPGnow and Drivethru RPG. NPCS: Simply use the format establish in the Servants of Gaius rulebook (page 66, chapter 7). Include the name, defense skills, key skills, expertise (if applicable), vices (if applicable). The character description is divided into: Present, Past, Future (to assist with the divination skill). Any character is welcome. These can be newly invented personalities or historical personas from 38 AD (though you may want to check the rulebook to see who we already have). Locations: This depends largely on what you submit. For cities use the Rome entry as a guide (page 98). For more specific locations like temples, tabernae, forums or ruins simply use your judgment. Because we are developing a series of province books, we will probably not be posting any province entries (simply to avoid confusion). Adventure Ideas: This is a pretty open format. General I want to post four to five big adventure ideas for each entry. So 1-3 paragraphs for each idea is probably good. Scenarios: These are longer and more involved than the Adventure Ideas. They still need to be compact enough for the blog format but could include a small investigation, an interesting scenario or encounter for any campaign. Historical Essays: 500 to 2000 word articles on key topics in Roman history. Generally these should be written in present tense (38 AD) unless they deal with something that occured before the period of the game setting. These can be about anything (fish sauce production, associations, the legions, etc). Monsters and Foes: Use the format established in the Servants of Gaius rulebook (page 82, chapter 9). This is similar to the character entry format except some monsters have special powers. Gods: Send us your gods using the format established in the Servants of Gaius rulebook (page 90, chapter 10). These entries can be longer than those in the rulebook (since there our concern was space). Each god should be described and have a single major power. The power is not all the god can do, just his or her signature intervention. Finally, submissions are not limited to the above categories. Feel free to contact me and suggest any ideas that aren't listed here. I talked a little about my Servants of Gaius campaign last week and want to continue with some notes from behind the GM screen. I must warn you, these are far from pretty. There is a good reason we hire artists to do our interior map work. 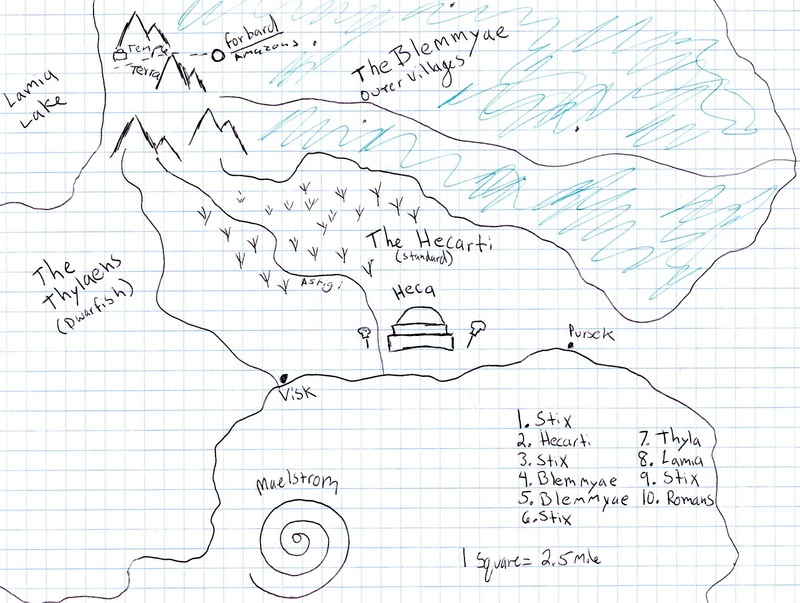 But the maps below show how I plan things like background details and travel. Again, this isn't pretty. But it marks the location of Rome's legions and Cleopatra's legions (as well as her allies in Mauretania). It is quite rough, but does the job for me. Presently Rome is winning but they are taking losses in the process and their biggest concern is the stability of the northern legions along the Rhine (where there are rumors of Neptune activity). This one was very rough as well but it had the major points of interest I needed (plus I had a city entry in my notes with population, exports, etc). These are just highlights of course. In addition to these details I had other stuff mapped out, like a small Iberian village where the cult was active, a cave used for their mystery rites and similar details. Servants of Gaius can handle just about anything in my opinion. The game was designed with investigations, mysteries and adventures in mind, but in terms of tone and genre it can support a broad range. We didn't write it to be strictly one kind of setting. It isn't Ravenloft in Imperial Rome for example. Certainly a GM could run it as a horror game, but that wasn't our intent, the intent was to deliver a deeply Roman setting but leave the final mystery of Neptune in the hands of the Gamemaster. But the way I run Servants of Gaius is very specific. I commit to Roman ideas about history and reality, using those as the foundation of my adventures. I like to have a strong mix of the fantastic and mythical. In the past I took a more realistic approach to historical settings (particularly Ancient Rome), treating them with the seriousness I felt they deserved. But over time I started to lighten-up a bit and learned that mixing myth with history pays dividends in the end. 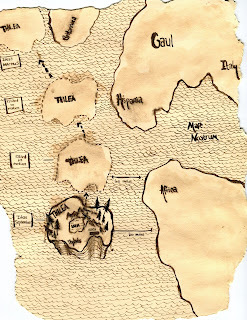 Above is a map from my Servants of Gaius campaign and illustrates how myth can blend with history. 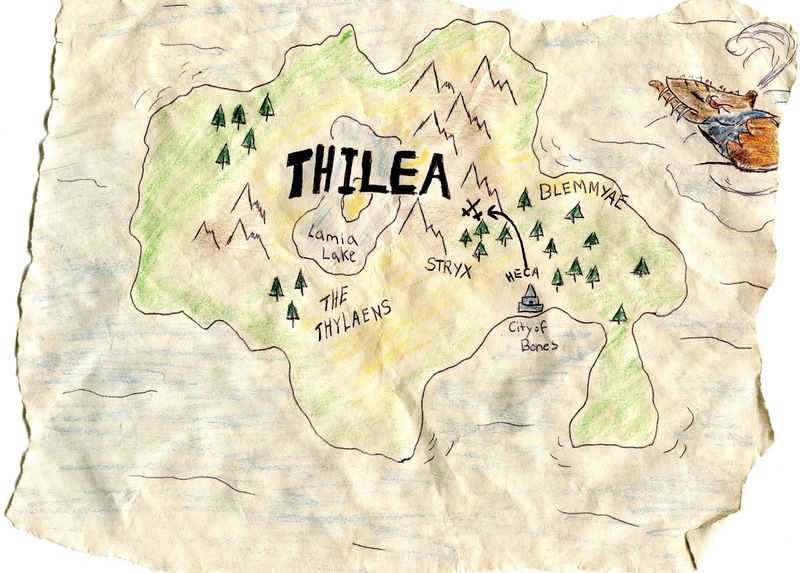 This is the legendary Island of Thule. 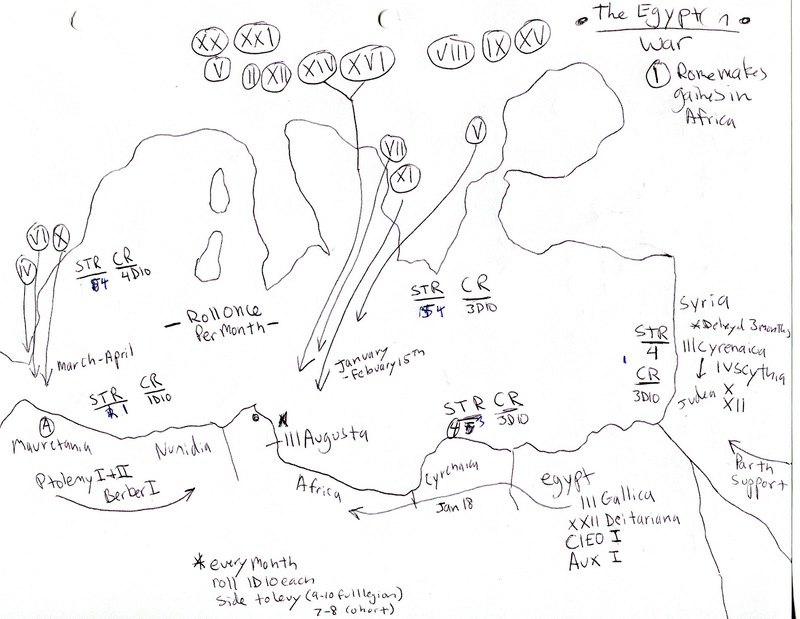 I took certain liberties with it and figured out a way to tie it to a growing conflict (in my own setting) between Rome and a recently ressurected Antony and Cleopatra. The players were sent on a mission by Caligula to recover "The Skull of Antaeus" a magical artifact that grants the wielder power over sea and land. Antaeus was a giant, the son of Poseiden and Gaia. According to legend he was buried in Mauretania, and his tomb was located by Quintus Sertorius (a Roman General and proconsul of Hispania who tried to break from Rome during the reign of Sulla). The details of the adventure are pretty extensive, but they revolved around locating the Skull which had been moved from Mauretania by Sertorius to the Island of Thule. In Thule Sertorius set up a small colony to keep and protect the skull while he continued his campaign in Hispania. In 73 BC Sertorius was assassinated, and a small cult of Iberians formed around his memory (he was popular and nearly revered by them in life). 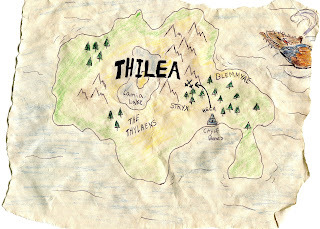 A mystery cult, their final secret was a route to Thule. To make Thule a bit more interesting (and to explain why it eluded navigators for so long) I decided it was a floating island that moved on a somewhat regular pattern (above map). 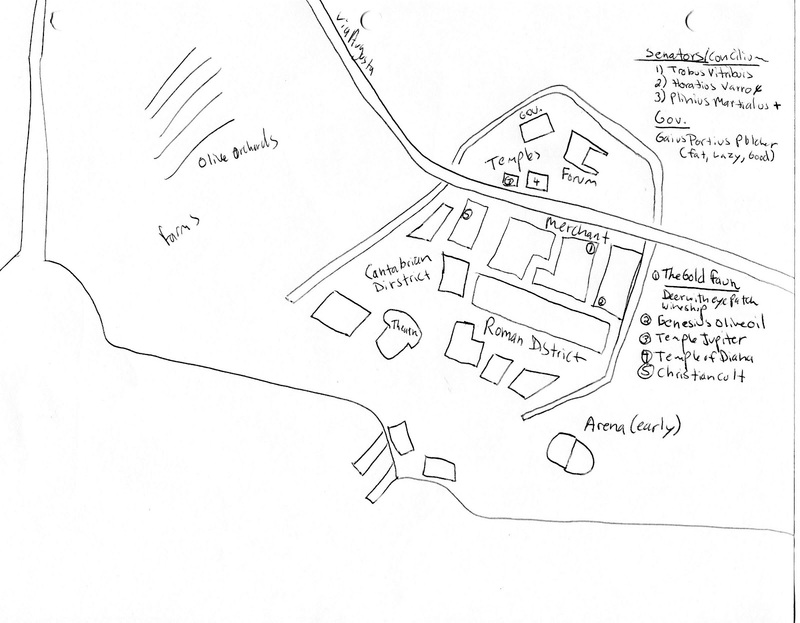 I then decided that Sertorius's colony (Heca) was a small pinpoint of Roman civilization surrounded by hostile Blemmyae and a lamia or two (not to mention an aggressive race of dwarven hunters). But even Heca had its problems. In 30 BC or so, a group of women broke away from the city, stole the Skull and brought it north where they established an "Amazonian" city-state under the protection of one of the local lamias. There are a few grains of historical truth here, but most of it I simply invented or stitched together in new ways. 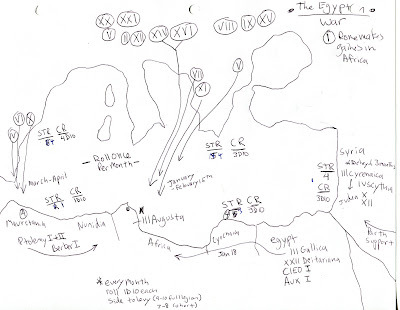 The Sertorian War is quite interesting and I liked taking that bit of history to use as a backdrop for the campaign. It mixed nicely with the myths of Thule, Blemmyae and Antaeus. And in the end gave us a great adventure that spanned several Roman provinces and ended with a bloody battle against a Lamia and her Amazonian priestesses.